I picked this up at random a while ago, but apparently this is a much sought after Trader Joe's product? Awesome! I've had the almond version before, which is usually sold around Christmas time, and that thing tastes freaking amazing. The almond version is hands-down the best thing I've ever eaten from Trader Joe's, so I can only imagine that this will be equally as amazing. 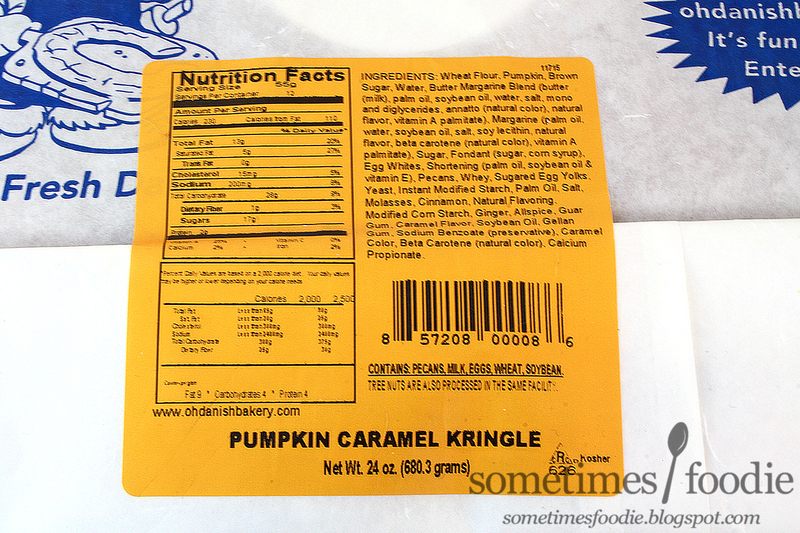 So what is a Kringle anyway? Let's find out! Apparently the Kringle is the official pastry of Wisconsin (lucky freaking Wisconsin!). It's made with a layered Danish pastry dough, and it's traditionally filled with nut-paste (giggity) or fruity mixtures, and topped with icing and chopped nuts. 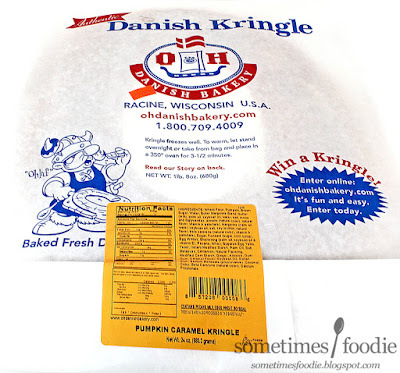 This Kringle from Trader Joe's was actually made, and frozen, by the O & H Danish Bakery in Racine, Wisconsin. 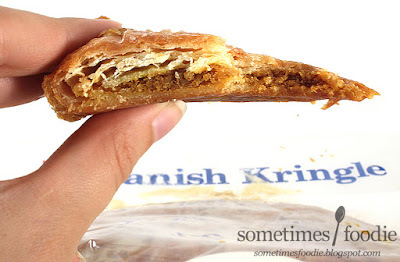 From what I've seen online, these guys are super serious about their Kringles. They've won awards and they offer tons of flavors. Everything from my favorite, the classic almond, to birthday cake! They're sold for $20.00 a piece online, so getting one of their pastries from Trader Joe's for under $8.00 is a steal. The only catch is that they're hard to come by. Normally they fly off the shelves, so if you want one of these bad boys, you have to get there fast. I didn't even know this flavor existed, so I just lucked out and was in the right place at the right time. So now that we all know what it is, let's see how this flavor tastes. Even if this thing was frozen and shipped all the way to Jersey, you'd never know it by the quality of this pastry dough. 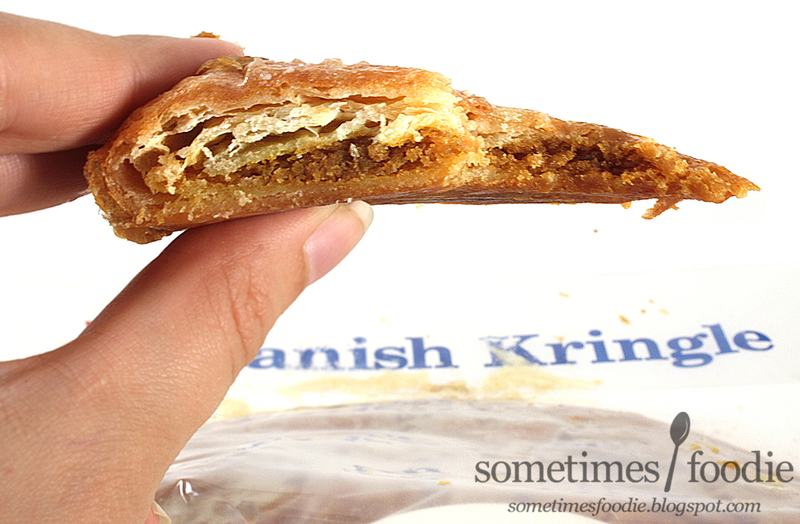 It's soft, but flaky, similar to other Danish-style pastries, and it's melt-in-your-mouth good. The fillings however, are pretty "meh.". I absolutely loved the almond version, which tasted like marzipan and crushed almond bits mixed with vanilla icing, but this? This tastes like a tiny hint of pumpkin pie filling, but it's overpowered by the crushed up pecans and pastry dough. Also, I didn't taste the caramel icing at all! Where's all this caramel I was promised? This tastes kind of pumpkin-pie-like, but that's not enough to WOW me. After a few bites, I found myself missing the almond version. After doing a bit of research online, mine looks VERY different from the other Pumpkin Caramel Kringle photos posted online! WTF? Mine has a lot less icing and way more pecans. Look at THIS person's Kringle, then look at mine. What the heck happened to all my icing? No wonder I couldn't taste any caramel, there was practically none to be had! 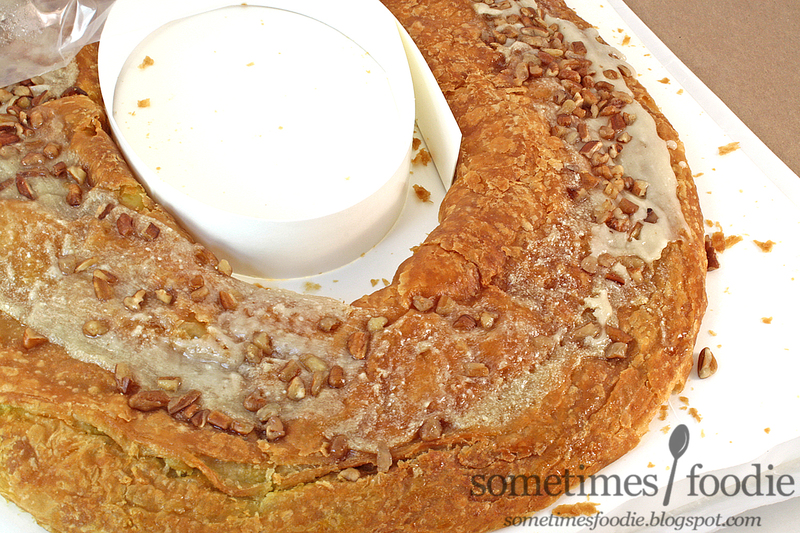 Maybe if I had a proper Kringle with it's icing intact I would have liked this more, but as is, I'm disappointed. I wouldn't buy this flavor again. I'll stick with the classic almond for sure. On a Pumpkin Scale of 1-5 (5 being the most pumpkin-y) I’d give this a 2! This tastes more like flaky pastry dough with pecans than anything else. Even though the pastry dough is really fantastic quality, the filling wasn't strong enough to bring out real pumpkin pie flavoring, and I was cheated out of the real caramel icing experience. If I had a better Kringle my opinion might change, but with this as-is, I can't say I'd recommend it.